French meringue has a light delicate texture, a melt in the mouth feel and perfect for delicate deserts. 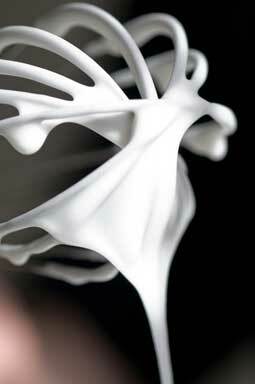 Swiss meringue has a firmer texture than French meringue so it is perfect for making decorations or bases for desserts. It is made over a bain-marie by whisking the whites and sugar together until it reaches a temperature of 38ºC (100ºF) then removing it from the bain-marie and continuing to whisk until it is completely cold. Italian meringue is much more complex and requires boiling sugar and water until it reaches the soft ball stage (115ºC). This type of meringue is good for making cassatas, baked Alaska and some butter creams. Seems so simple now but who would have first thought to whisk egg whites? If it comes to that why and how was the whisk invented? It all had to start somewhere after all. History tells us that meringue was first created in 1720 by a Swiss pastry cook called Gasparini and later the French and Italians adopted it and adapted it to their own style of cooking - it was enjoyed by both Royalty and common folk alike. But to make any of these, a successful meringue must be achieved - tips on successfully whisking egg whites. French meringue because of the icing sugar has a delicate texture and a melt in the mouth property perfect for delicate deserts: piping out and baking into shells for decoration, joining together with cream or piping into nests to fill with ice cream, sorbet or fresh fruits. We have all, at sometime burnt the cake we were going to serve for dessert, Well this is a great dessert for keeping up one's sleeve when you need to produce something impressive in a hurry! The name literally translates from the French as Snow Eggs. For this dessert you will need some French meringue mix as above (up to and including stage #3) and some nice fresh egg custard sauce (Crème Anglaise).